LONDON, UK (ANS) — One of the favorites for Team USA this Olympics has been 16-year-old Gabrielle Douglas, who helped her team garner gold in women’s gymnastics. 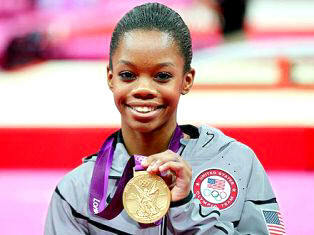 She also competed in the All-Around competition, along with teammate Aly Raisman, and Gabrielle took gold once again. Setting Gabrielle – affectionately called “Gabby” by her teammates and fans – apart is her willingness to share with the press, Facebook and Twitter friends, about what gives her strength, courage and peace in the midst of the fierce contest of skill: her faith, and relationship with the Lord. In an Us Weekly interview, Gabby said, “Right before a competition I pray and listen to music.” And when she was asked by the press how she focuses and stays calm when surrounded by the immense pressure of the Olympic competition, the teen replied that she meditates on Bible scripture. A video posted on Crosswalk describes the journey Gabby and her family has taken on her road to the Olympics, including the difficult decision by her mother Natalie – a single mom– to allow her youngest daughter at 14 to move halfway across the country to train. Despite the cultural differences, Gabby found a second home with her host family in Des Moines, Iowa, and the move for intense training paid off. Watch the moving video here.